Will you be selling your extra copy at a profit? Thanks to DeliveryQuoteCompare.com the world now knows just how many of you preordered Grand Theft Auto V, only to rush out to the shops and buy a copy as soon as it hit the shelves. Of the 1,123 UK gamers polled in DeliveryQuoteCompare.com's survey, 14% - or 1 in 7 - of you just had to see Trevor go nuts and kill bikers. Impatience was the number one reason for getting a second copy - 74% of you said you just couldn't wait - and most of the people who couldn't wait stood in line at a midnight launch to get a copy. Most of the folks who ended up with two copies intended to return it and get a refund, but 32% figured they could sell it on to some other gamer. Most of those who thought they could sell it, think they can make a profit if they sell it right now, due to high demand. Some of these folks had preordered several months in advance, and most of them admitted that their preorders arrived on time. On time just wasn't good enough; they had to get their fix. Only 28% claimed time delay as their reason for wanting a second copy. "It's easy for people to think 'well what's one more day'," commented Daniel Parry of DeliveryQuoteCompare.com, "but if you've been anticipating something keenly then one more day seems a long, long time. Especially so if you've booked it off work!" 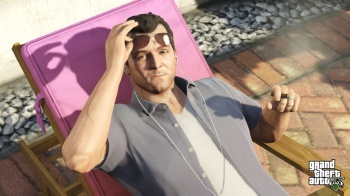 So if you were wondering how GTA V achieved its billion-dollar-sales, now you know; for a lot of you, it was a case of 'SHUT UP AND TAKE MY MONEY!' Even if your money had already been taken.